To have perfecting clean and shiny windows which will present your property the best possible way use the services which we provide. Our company is located in Dulwich SE21 and offers some of the most professional and inexpensive window cleaning in London. Our team of cleaning specialists will arrive at the appointed day and time and provide the necessary sanitising of the windows, sills and frames. 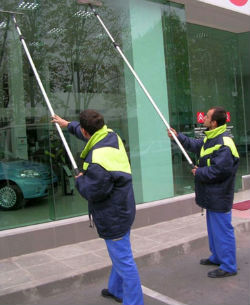 They work with purified water, no detergents at all and a water-fed pole which can reach high external window surfaces. If you rely on us to provide the window cleaning which you need, your home, office, other domestic or commercial property will look presentable. Our team of cleaning technicians are qualified, trained to sanitise windows professionally and know how to do the work. Rely on them to remove the dust, grime, stains and blemishes form the windows in your flat, house, office, hotel and other estate. The cleaning will be carried out with the help of professional tools and purified water which guarantee the desired results. Use our window cleaning services which are at your disposal in Dulwich from Monday to Sunday at competitive rates. If the windows in your home, work place or commercial estate had become dusty, filthy and have smudges, call us and we will take care of them. Our cleaning techniques are very effective, professional and guarantee brilliant results. To have perfecting spotless and shiny clean windows call us or use our booking form. We can provide the window cleaning which you need in SE21 Dulwich at a time which serves you best. Our company works seven days per week and is ready to sanitise the windows in your home, work place and business property.